Honte is a Japanese go term meaning, the proper move. It is a solid play that leaves few or no weaknesses behind and has a followup. It can sometimes be difficult to identify a honte, because its followup may be difficult to find. The opposite of honte is zokushu and usote. is the quintessential honte. It may look slow, but it shores up Black's weakness while threatening a followup -- to capture the stones. - saves those stones. Black keeps sente. is usote. 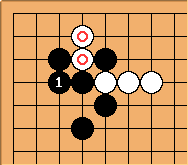 It also threatens the stones, but after White saves them, Black must go back and repair his defect with . Black loses sente. For more examples, see Honte Library. John Fairbairn has assembled several famous examples of honte with commentary, as well as discussion of the associations that a Japanese player might accumulate. Bob Myers: No, I don't think honte and kyuusho are equivalent. Honte, as described above, is used to describe a move which superficially appears slow but is actually very solid, usually in the context of the opening. Kyuusho, on the other hand, simply refers to the vital point of a shape, for either attack or defense. Bob McGuigan: The kanji 本 for hon in honte 本手 is the same as in hon 本 "book" or nihon 日本 "Japan" and its meaning in this case is "real", "genuine", "regular" or "true" as in honmono 本物 "the real thing". So honte would be a move which is real or straight-forward, as opposed to tricky or flashy. Maybe "sober" is a good attribute of a honte. I guess "honest" is OK as a translation, but it has always seemed to me to be a little strange, as if someone picked an ordinary English word that looked the most like "honte". Bill: But calling a play "too honest" is a mild criticism. My impression is that such plays are always honte. Still, I think you are right, Bob, "honest" is not such a good translation. Richard Cant: The translation of Kageyama's book "Lessons in the Fundamentals of Go" uses "the proper move" as the translation of "Honte". 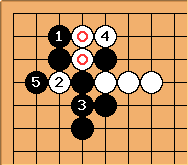 RussellKhan: In Sakata Eio's "Tesuji and Anti-Suji of Go" it gets translated as "the real move". That's actually what brought me to this particular page -and I should thank you all, I think I understand the term much better now. HectorM: I have very little knowledge of japanese, but when I read the definition of honte, the word 'honest' did come to mind. In american sports, the term 'keep the defense honest' is very common, meaning that the defense should stay solid and not be greedy or overreaching. for example, in basketball making sure that the three point line is well defended and not concentrating too much on the paint is considered 'honest'. in this context, it seems to me that honest is a very good translation of 'honte' as i understand it, meaning solid and not overly ambitious. John F. It just occurred to me that "the (most) sensible move" might be a useful translation. The deictic "the" (or "the most") is important, capturing part of the meaning of hon. RobertJasiek: "A proper move postpones the necessity for yet another local move until much later by eliminating aji and creating thick shape." (Joseki Volume 2 Strategy, p. 48.) In contrast to the definition at the beginning of this page ("solid play that leaves few or no weaknesses behind"), my definition adds the requirements "postpones the necessity for yet another local move until much later" (with just one move, the proper move solidifies for a long time) and "creating thick shape" (this is a stronger, more accurate requirement than just "solid"). John F. Given that this page is about the Japanese term honte, Robert's definition is inadequate. As in Bob Myers comment above, a defining element of honte is that it initially appears slow/lukewarm/slack. The coda is that turns out to be correct, and for the manner in which it is correct Robert's definition is fine. However, the problem is not so much with the definition - I think most people understand the concept well enough - but with the English equivalent. All the suggestions I've ever seen suffer major defects (incidentally, a major problem with 'honest' is that the US sports usage means nothing reliable to a British audience). The nearest, and perhaps extremely close, chess equivalent seems to be prophylaxis. RobertJasiek: Please notice this page's aliases proper and proper move! It is, of course, possible that in Japan the Japanese term honte has a somewhat different meaning from the English term proper move. We can 1) create two pages, one for honte and another for proper move or 2) work out and state both terms' meanings on this page. Dieter: the point of this page is to find an English equivalent and hence an understanding of the Japanese word and concept honte. The purpose is not to explain a non-existent word in go literature as "a proper move". We've been through similar trouble when translating all different meanings of thickness. I think the valuable idea here is that thick moves often show their value in the long run. That makes some thick moves in some positions the proper move, despite their slow appearance. In other positions a more influential move is the proper move, despite their greedy appearance (because one is behind), yet that is not called honte because mankind is rather greedy by nature than slack. If you drop that whole context of a game's dynamic nature and man's greedy nature, "the proper move" becomes a rather poor concept. BTW, I like "sensible" a lot as a translation. RobertJasiek: English and Japanese go terms using the same Japanese word sometimes have or sometimes have not the same meaning. Either can have advantages and disadvantages. Why should we not explain both usages? Maybe the purpose, when this pages was created, had, as you indicate, been restricted to only the meaning in Japanese. Does this dictate us to overlook the meaning of proper move in English? I do not think so. Bill: Well, the main reason that the usage of a Japanese go term differs between Japanese and English speakers is that the English speakers do not understand the term. Hyperpape: Is there a reason why we want to avoid "proper"? It is as closely connected to the idea of slowness or being lukewarm as words like sensible or prudent. And of course for many people, there is a strong urge to not do what is proper, but to aim for something more exciting or daring. RobertJasiek: Proper (move) is the proper word / phrase because it has been established in English as the related translation word / phrase of honte for decades. Anonymous: I think 'prudent' works fairly well as an English translation. Other ideas might be 'safe', 'solid', 'reliable' or 'cautious'. Out of all the possible terms, I personally favour the term 'reliable'.